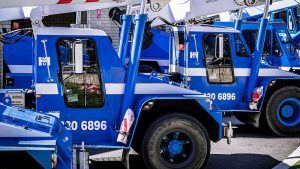 With over 30 years of experience as one of the most successful crane hire companies in Perth, we’re helping thousands of satisfied customers lift all manner of heavy loads throughout Western Australia. Our wet crane hire costs are highly competitive, and the standard package is a combination of value and quality. Our crane operators are a superb choice and hold a wealth of experience. Their commitment to the project ensures excellent maintenance and quality results. 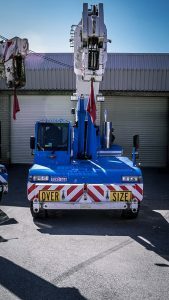 For wet crane hire Perth can rely on, give us a call. It’s out on the job site where our pick-and-carry and slewing cranes, can save you time and money by achieving lifts that would be impossible without the right machine for the job. Pre-cast steel and concrete works wonders but needs the right crane to lift into place. We can also send a crane to help you with all aspects of structure steel erection and any beams you need hoisting up. All those bundles of bricks or timber that would take a labourer hours to offload can be handled quickly and effortlessly by our high-powered cranes. No construction job is too big for Myaree Cranes and none is too small. 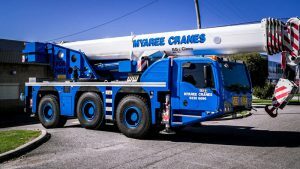 Few crane hire companies in Perth are marine specialists, but this is an area Myaree has dominated for decades. Our slewing cranes are an almost permanent fixture across the best marinas in Perth, from East Fremantle Yacht Club to Royal Perth Yacht Club Perth and every other reputable marina that needs boat or yacht lifting. We’re marine maintenance experts as well, having worked on the Duyfken and the Leeuwin. If you need masts removed or replaced, gearboxes and gensets lifted into place, or pretty much any marine-related craning carried out, just give us a call and we’ll do the rest. It’s not just in a commercial, industrial, or marine setting where Myaree delivers. Residential crane hire forms a large part of our workload due to the large volume of heavy objects that need lifting upstairs or simply won’t fit through the front door. From the bulkiest grand piano to the heaviest swimming pool, if you’re wondering how on earth you’ll manage, our residential crane hire is the obvious answer. From Franna cranes and slewing cranes to Tom Thumbs and much more, we’ll lift your pizza oven, sauna, pool, or furniture wherever you want it with the minimum of fuss. 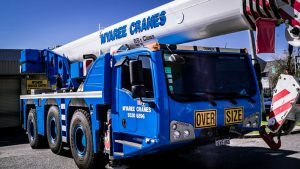 If you’re looking for a crane hire in Perth, look no further than Myaree Crane Hire. Our fleet of ten diverse cranes means we have the right machine for just about any commercial heavy lifting you need carrying out. When the going gets heavy, raw power is not enough. You need stability and also the confidence the job will be executed safely. All of our cranes combine maximum maneuverability with powerful rigging and cabling coupled, to reach the required heights for almost any commercial lifting project. When your loads get too much for even our biggest and most powerful crane, we’ve got the perfect solution: we’ll send two or more. Dual-lifting demands meticulous planning and load calculation, so the risks are mitigated without impacting progress. Once we’ve got everything lined up, from load weight and geometry to centre of gravity and ground conditions, you’re ready for multi-crane lifting capable of hoisting even the most unwieldy and heavy machinery, boats, equipment, or supplies. All factories come with heavy equipment and machinery. 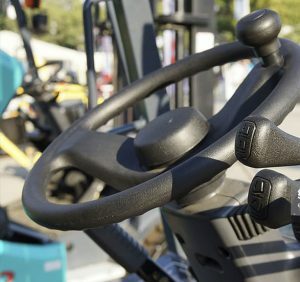 Shifting gear around within your workshop or moving to another location might call for machinery you don’t have. That’s where we step in. Get in touch with us and we will assess your relocation requirements to then recommend the most suitable crane and rigging gear hire from our comprehensive fleet . Tight and cramped spaces are no barrier for our Tom Thumbs or Franna Crane Hire, which can zip in and out of the most awkward spots. When the going gets even heavier, we’ll suggest dual lifting and provide multiple cranes, depending on the machinery you need to lift.